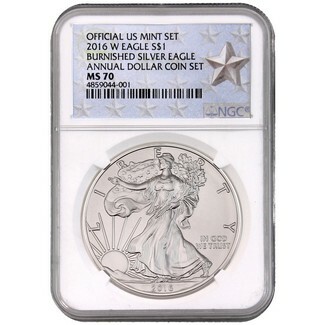 The mintage on the 2016 Annual Dollar Coin Set is 19,818; making this attributed 30th Anniversary Silver Eagle one of the lowest minted of all time. Population from NGC on this coin as of 9-25-18 is 192. Struck at the West Point Mint, this burnished Silver Eagle is encapsulated with a special Silver Star Label.